A few members of our family have food allergies. Nothing too life shattering unless the concept of a stomach ache or feeling nauseas appeals to you. But we are lucky in the sense of no life threatening allergies. Growing up we did not even realize food allergies existed. We had to eat what was put in front of us. Peanut butter sandwiches were the mainstay of my grade school lunches, that and an apple which I threw in the trash every single day. (my poor mom) Thank goodness things have changed and food allergies are now recognized. 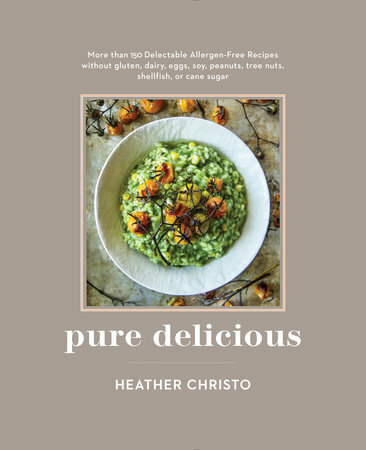 That leads me to “Pure Delicious”, a cookbook written by Heather Christo who is a trained chef and graduate of Le cordon bleu. She is also a blogger who has food allergies herself and a mom to two young daughters with food allergies. All serious enough to warrant some major food changes. Her introduction begins with a story of their transformation and ends with eight weeks to a new normal. In between there is info on the food elimination diet, how to create a new food lifestyle that is wholesome and delicious, helping your kids through the transition and adjusting to social situations. Then comes the recipes; there are over 150 to support your new lifestyle. They are free of gluten, dairy, soy, peanuts, tree nuts, shellfish and cane sugar. That’s pretty impressive in my book. I made three of her recipes and was very pleased with each and every one. The first one I prepared was the pasta with sausage, white beans and mustard greens. The pasta was gluten-free but everything else was what you would expect. Will be making this one again. The second dish I made was Broccoli Chopped Salad with Tahini Vinaigrette, which I brought to a potluck. I took a picture before and forgot to take the finished one right before leaving. There was nothing left to photograph. This salad was crunchy and delicious. The last dish was the Chicken Teriyaki with scallions and sesame seeds. The recipe calls for boneless skin-on chicken thighs and I used boneless skinless. In this particular instance I think that skin-on would have been a better choice. We both enjoyed the flavor it was the look that was a little off-putting. The skin would of given this meal a beautiful color. In the past when entertaining others with food allergies or intolerances I felt overwhelmed. I now have "Pure Delicious", a resourceful cookbook with healthy and delicious recipes in my arsenal just waiting for the next occasion. You can too! I love Heather's blog and I bet her recipes are wonderful. These look terrific and that salad is calling my name. This is a lovely review Cheri - thanks! Thanks Tricia, I enjoy the way to cooks, she seems like a very caring person. Looks like an inspirational cookbook with delicious recipes! Thanks for the intro Cheri! It really is Kim, she has embraced and celebrated all the foods that they can eat. I love that chicken teriyaki! Thanks for the review, Cheri. Thanks Angie, we did too! Thanks Anu, it's a wonderful book! These all sound delicious. The chicken teriyaki would be a terrific meal, and the salad sounds like a real winner. Thanks Beth, they were all delicious! I so admire how you try so many different recipes, from all different sources! These look wonderful and I love learning about new cookbooks. 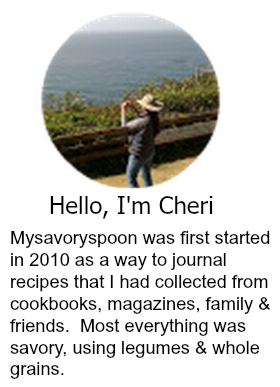 Sounds like a great cookbook, Cheri. The broccoli salad is so beautiful with the red and green colors. That would be pretty at Christmas, too. Love all these recipes. Thank you for your review! So funny you would say that I was thinking the same thing too, the red and green are beautiful together. Thank goodness we don't have any food allergies. The book must be wonderful for those that do. My daughter-in-law has a friend whos daughter is so allergic that just the smell of peanuts is enough to send her to the emergency room. But they have adapted very well from what I understand. Take care! Such a fun and inspiring cookbook Cheri. Have to try the Chicken Teriyaki and Broccoli Chopped Salad with Tahini Vinaigrette. Thanks for sharing. I hope you share at our link party, DI&DI. Running a little late this week, just linked up appreciate the reminder. Hope your week is going well. Cheri, I agree, this looks like a very inspirational cookbook and the recipes sound healthy and delicious. You wrote up a wonderful review and cooked some very good looking dishes from Heather´s book! Thanks Andrea, it was easy to do with a cookbook like hers. Hope you are having a great week. Delicious Looking Dishes Cheri, and the book looks quite nice too! Thanks Peggy, it is a keeper for sure. 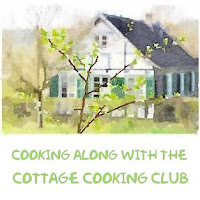 I love Heather's blog, but apparently don't visit enough to know about this cookbook. These recipes all look amazing, and how great that they help make it easier for people with allergies to still have delicious meals! I agree Mary, her recipes are delicious and you do not feel like you are missing out on anything. I do try and make health delicious meals for the family. It's a great cookbook, thanks for stopping by Julie.